Steve Bannon – Where is the Light? 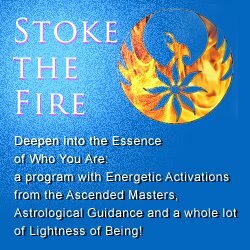 Astrologers love to get the birth information of people they meet, know or who are in the news. It gives us a window into that person’s makeup, and yes, a deep dive into who they are. This can be incredibly useful, but also a bit of a mystery… we can know what an experience may have felt like or how it affected a person, but as to the exact situation or experience — not necessarily. Chart study can reveal information that is a surprise. A person may be more sensitive than originally thought or more complicated. In the case of a celebrity, their horoscope can humanize them; suddenly they are not so 2-dimensional. The birth time for Steve Bannon is not public material, so I use a noon time (which is acceptable for someone in the public eye). When we don’t have the time of birth, the Rising Sign (Ascendant) which represents the persona may be off. The Moon sign changes every 2.5 days, so that may also not be in the sign a noon chart indicates. Nonetheless, this chart for Bannon is pretty interesting. 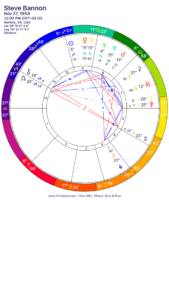 The noon chart gives him Aquarius Rising, apt for a rebel and someone who makes his own rules. His Sun in Sagittarius makes no geometric aspects to any other planet. The Sun is self-expression; it indicates how one wants to shine. There is a strong need to take the reigns, but not tremendous clarity about what he wants to achieve. It’s as though the act of moving, creating change is enough with no ownership as to why. This is emphasized by Saturn, also with no aspects to another planet. Both the Sun and Saturn symbolize a person’s inner authority, sense of place and responsibility. These don’t seem to be a present part of Bannon’s inner landscape. If the impulse for this surfaces, he may take no notice or shunt it off as someone else’s wish. His Moon is in Leo and probably conjunct Pluto. He is known to be highly charismatic when he wants to be and the fire Moon and Sun thrives on inspiration and passion. Pluto with the Moon calculates and is attracted to intensity; sometimes even courts death. For all his financial success, this is not a person who is particularly grounded. There is not much of the element earth in the horoscope which gives a person a practical perspective. Now that he is in a position of such power, the discomfort of regular public scrutiny will wear on him. The quick bite of his Mercury/ Venus in Scorpio when baited by reporters may not track well over time. This may be particularly evident in 2018, when his tendency to disrupt gains such momentum that there’s no holding it back.